Let’s admit it, running a business has plenty of challenges. Why create more by overlooking the critical connections that support your business? Throughout my tenure as a business owner and entrepreneur, I have found three connections a business must have to reduce the challenges. These are connections with employees, clients, and technology. Let’s take a look at the importance of these three connections. For starters, firms need to create a workforce that are driven to work hard and are enthusiastic about their jobs. To achieve this, employers must find ways to create connections with employees that shows them you see them as people, not just employees. The easiest way to show an employees you see them as people is to engage them. For example, use meetings as a time to let everyone express their ideas. Ask for their opinions, and ask them to think critically about things. At the end of the meeting, people walk away feeling as if they contributed to the better good of the organization. For more about connecting employees, check out the “9 Ways to Connect with Employees” blog. For project-based firms, it’s important to connect with clients throughout the entire project lifecycle. Ponder this question. Have you ever completed a project for a client and you believe they are completely satisfied with your services, but find out later that they were not happy? Sometimes even a client you know may feel uncomfortable telling you something is bothering them. So how do you identify there is an issue? First, work with the client to setup expectations before a project starts. 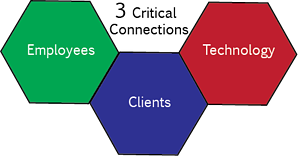 Secondly, continuously check-in with a client on a regular basis during the project lifecycle to manage expectations of the entire team. One of the best ways to do this is through an automated feedback process. Watch this vlog, “Client Connections – Create Unique Client Experiences” for more ideas about connecting with clients. Most if not all businesses use technology to support their operations. The question here is, how many different systems does a business use and how do they connect? In reality, they usually don’t seamlessly connect and share information. As a result, critical business data is stored in multiple systems, making it difficult for business leaders to make informed decisions. For businesses to be successful, systems and applications must be in place to support all departments. Although each application is designed to support a specific function of the business, the data for these systems should start with a core ERP system and have the ability to connect to other critical systems. This allows for clear visibility throughout the entire organization. Interested to learn how you can connect to other external systems? Watch this vlog, “Systems Connections – Is Your Critical Technology Connected?” to learn more. A project-based firm is so much more than the service they provide; rather, it is a network of connections that require special attention. It is important to connect and communicate with employees and clients in order to build a sturdy foundation for your business to grow from. Connecting with technology is equally as important, as doing so can maximize efficiency in operations while also providing an edge against competitors. Ensuring that these three critical connections are a priority is simultaneously ensuring your business will be successful.